We offer cheap labels and are confident we are the CHEAPEST ON THE WEB and DELIVERY IS FREE TO UK MAINLAND – who else can offer you this service? If you click through to our website you will find detailed lists of all our stock lines and speciality laminates. AA4 sheet labels are our speciality in particular White Laser Labels, although we also supply SRA3 sheets and labels, Roll labels – printed or plain and Fanfolded – Computer labels again printed or plain and all at competitive prices. All of our products are manufactured to British Standard ISO9002 – bearing this in mind you can buy cheap labels from A4LaserLabelsUK with complete confidence. Don’t worry how small or large your order is – we will be happy to quote and supply – and please be assured we WILL RING YOU BACK and we are confident you will find OUR SERVICE IS THE BEST AROUND. We have over 20 years experience in the packaging and label industry and you will find us helpful and friendly and we will always find a solution to your labelling needs. Go on give us a try – you have nothing to lose. We now have a RANGE of SRA3 sheets specially designed for Digital Print Systems - Toner Based Laser and HP Indigo Printers. SRA3 Sheets – Machine Coated Paper with Permanent or Removable adhesive – solid or score back, or Matt white Polyester with Permanent adhesive solid back. We also have a RANGE of SRA3 Diecut sheets specially designed for Digital Print Systems - Toner Based Laser and HP Indigo Printers. - Packed in 100 sheet boxes and minimum order quantity is only 1 box per delivery. A4 sheets can be printed up to 6 colours with the ability to die cut on both face & backing paper concurrently. We are also able to edge or window trim the A4 sheets which is of particular benefit to large users of A4 labels as this considerably reduces the adhesive build-up in your printers therefore improving reliability and reducing maintenance. 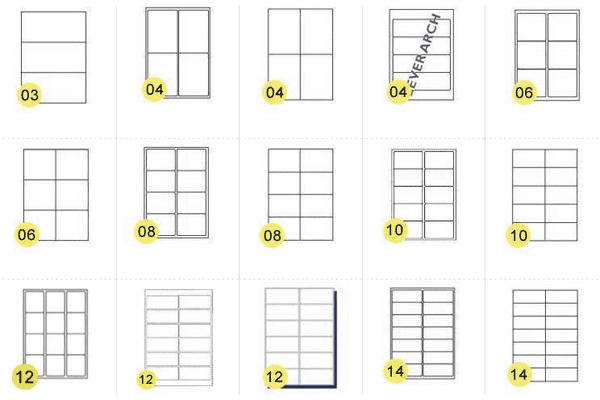 In addition to the standard sheet products we are also able to produce Integrated Sheet Labels which are widely used for: Invoice / Delivery / Acknowledgement notes in the Mail Order, Internet Retailers & TV Shopping Channels. These can be printed on both sides. Whilst Dot Matrix technology is generally being replaced by more recent developments (Laser, Inkjet, Thermal) Dot Matrix still represents the largest element of the overall Variable Print Label market. Our Fanfolded (or Computer Labels) are offered in a range of sizes in 1, 2, 3 & 4 across label layouts from our stock cutters as well as an extensive bespoke print & converting option. The Roll Label market consists of 2 main areas: Primary Labels & Secondary Labels. Primary Labels are generally promotional with very little variable print and relying heavily on the Pre Print to fulfil the requirements of the label. Secondary Labels are essentially information providing such as Bar Codes, Instructions, Addresses or Sequentially numbering. Such labels generally require an element of Variable Print and this is normally achieved by way of Direct Thermal or Thermal Transfer technology. There is an extensive library of Label Cutters for both Direct Thermal and Thermal Transfer Labels. We offer a bespoke service, which includes printing flexographic up to 7 colours. We also offer digital printing which is especially competitive for small runs. However big or small we can find a solution and offer you competitive prices – we can also offer artwork service if you do not have print ready artwork so no need to worry – we can do it all. Legislation dictates that all substances readily available to the public identified, as "toxic", "very toxic", "harmful", "extremely flammable", or "corrosive", and any aerosol propelled by butane, must have a tactile warning label to alert the blind or partially sighted that they are handling a dangerous product. Our tactile labels are made in accordance with European Standard BS EN ISO 11683:1997. The label material is a transparent polypropylene enabling the orange warning to show through. The raised triangle is equilateral with 18mm sides. The overall size of the label is 25mm dia. and is supplied on reels of 2,500 and can be configured for machine or hand application.